Not all POS systems are alike and without the right knowledge going into the shopping process, you can wind up with something that leaves you less than pleased. Make sure that if you are looking for a new POS system you take some time thinking about what you want from the system. You should also invest time in shopping around and taking a look at a few different platforms. Here at Journey Business Solutions, we offer an array of POS systems to Fort Worth businesses and companies from surrounding areas. We can work with you to ensure that you have access to the right POS system for your needs. Check out these top four things we believe every POS system should have. One of the most important aspects of any POS system is the level of security it offers. Nothing is worse than having your customers’ data breached due to a shoddy or outdated system. Make sure that you ask about the level of security each system offers. You want to be able to run credit and debit cards with no concerns about the safety of your customers’ information. Not only is security important for the actual protection of your customers’ data, but also for your company’s image. It is extremely hard to recover from a security issue and no business is too small to be at risk. For this reason, requiring a high level of security in your POS system is a must. Also top of the list in importance is the reliability of your POS system. You need a system that will operate smoothly without any hiccups, day in and day out. If your POS system isn’t reliable it will be useless to you and can cost you countless dollars in profit. A good sign that a POS system will offer reliability is indicated by the level of customer support offered. If a POS system is known to have a slew of issues, the platform will very likely not offer extensive customer support. However, if a company offers great around-the-clock support, they likely have a business they believe in and will stand behind. Another key factor to a good POS system is speed in processing. You need a system that will allow your business to run smoothly and efficiently. Nothing is more frustrating to your employees and customers alike than being stuck waiting on a POS system to process payments while a line forms. Even if your business is online, you don’t want to lose customers because they got tired of waiting for the payment to go through. In fact, in online shopping, speed is paramount. A slow system will not only cause frustration for your customers but can also cause them to doubt the security of the system. Forward Facing Interface: Shop for a POS system that provides your customers with an easy-to-use interface. These systems usually offer your customers options such as entering their phone number for loyalty programs, adding a tip if applicable, and signing electronically. Card Free Loyalty: Rewarding your customers for shopping with you is a great way to ensure they keep coming back. Many POS systems now offer easy to access loyalty programs that don’t require a card in hand. By utilizing emails or phone numbers, your customers can quickly access their reward points and you can encourage your customers to return through carefully timed emails or texts. Insightful Data: New POS systems will also offer improved insight into your business through the ongoing collection of data. From this data, you can glean information about how your customers shop, what your most popular products or services are, and how you can better improve the shopping experience. Inventory Management: A good POS system can also provide you with ongoing inventory management. This integration will make it easy to not only keep track of what needs to be ordered, but many systems can also help you with predictive ordering based on the collection of data from your business over time. 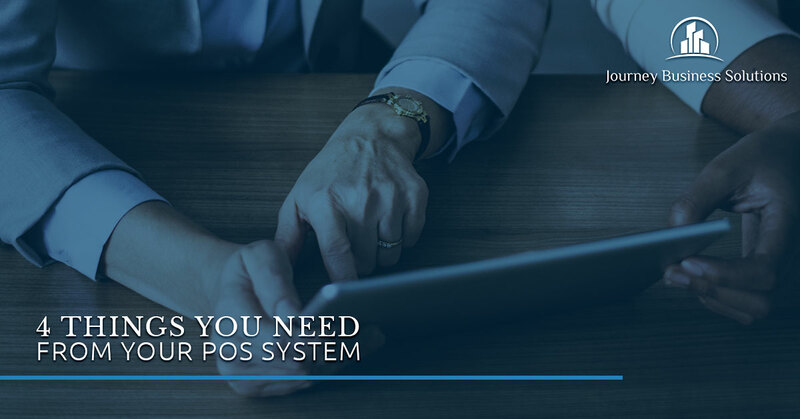 If you are looking for the ideal POS system for your company’s specific needs, reach out to Journey Business Solutions today. We can help you choose the right system for your team. Whether you are operating an online store, a busy restaurant, or a small clothing shop, we have an array of choices available.